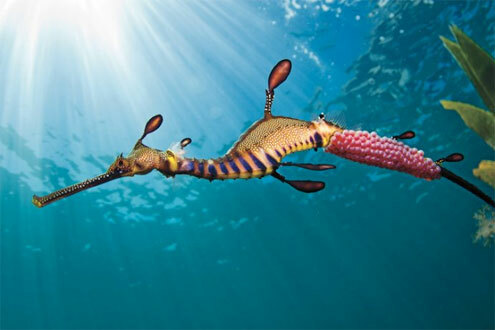 On the Mornington Peninsula, South of Melbourne, you can see one of the most unique and beautiful life forms in the ocean — the Weedy Seadragon! Whether you're snorkelling or scuba diving, you can discover their underwater world and get up close and personal with these magnificent marine creatures. Weedy Seadragons, or Common Seadragons, are the Victorian state marine emblem. Unfortunately, they are listed as 'near threatened' by the International Union for the Conservation of Nature, putting them in the same category as the white rhino and the eastern bettong. Our favourite place to go and see Weedy Seadragons is Flinders Pier, located just inside Westernport Bay. Flinders Pier is arguably the easiest place in the world to find these iconic marine creatures. The BBC Natural History Film Unit spent three weeks at Flinders Pier in January 2016 to get footage of Weedy Seadragons for episode 5 'Green Seas' of the documentary Blue Planet II. There are dozens of them here and during the right season you might see the males carrying eggs around. The next best place to see Weedy Seadragons would be Portsea Pier. Unfortunately Portsea Pier has been somewhat ruined as a dive site by the Port Phillip channel deepening programme carried out by the Port of Melbourne in 2009. Since the dredging, the swells at Portsea Pier are more frequent and more intense. 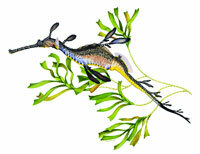 You can also sometimes find Weedy Seadragons at Rye Pier, and Blairgowrie Pier. But Flinders Pier is our recommendation. The Weedy Seadragon, Phyllopteryx taeniolatus, is a member of the Syngnathidae family which includes seahorses, pipehorses and pipefish. It's found only in southern Australian waters, living in coastal waters from Newcastle (NSW) to Tasmania and Geraldton (WA) with its range centred around Victoria. The Weedy Seadragon (also Common Seadragon) was selected as Victoria's official marine faunal emblem by public nomination in 2002. Forests of brown kelp and seagrass meadows (mainly Amphibolus sp.) are vital habitat for the survival of Weedy Sea Dragons in shallow waters. In deeper waters they prefer to live amongst offshore reefs containing sponge gardens and brown kelp. Long leaf-shaped flaps of skin protrude from stalk-like bony projections at intervals along the top and bottom of the body. This enables seadragons to perfectly camouflage within their habitat and be easily overlooked. Breeding occurs annually, usually in late Spring when the seadragons pair up. Like their pipefish and seahorse relatives, the male seadragon broods the eggs. With Weedy Seadragons, up to 300 eggs can be laid by the female underneath the male's tail where they are brooded. The eggs are bright pink when fresh and darken as they develop. They hatch, after 2 months, as 25 mm long miniature versions of the adults, but grow quickly to 7 cm within about 3 weeks. By 4 months they are about one quarter of the length of an adult and after 2 years have reached their maximum size. Weedy Seadragons can probably live up to 10 years in the wild. Their diet consists mainly of small crustaceans. The young feed almost exclusively on mysid shrimp. Adults will feed on mysids, other small shrimp and crawling crustaceans, including squat lobsters. Using its long thin tubular snout the Weedy Seadragon captures food by a powerful suction action, drawing water and prey rapidly into its mouth. Special muscles in the snout can widen it to capture different sizes of food. The Weedy Seadragon, as part of the Syngnathidae family, is fully protected as 'Protected Aquatic Biota' under the Victorian Fisheries Act 1995. Where can Victorians experience the world of Weedy Seadragons? In the wild, if you look carefully, you may be rewarded with a view of this amazing creature hovering around piers near clumps of brown kelp, along the edges of sea grass beds and in deeper water amongst sponges and brown kelp forests on offshore reefs. Snorkellers and divers can observe Weedy Seadragons in many of the Marine National Parks and Marine Sanctuaries situated along Victoria's coast, near Portland, Point Addis, Queenscliff, Barwon Heads, Portsea, Rye, Flinders, Wilsons Promontory and Gippsland. Find out more about the Weedy Sea Dragon please see Australian Museum: Common Seadragon, and Wikipedia: Common Seadragon. If you would like someone to show you our Weedy Seadragons, please chek out our Melbourne Guided Dives page. If you need scuba gear to go and see the Weedy Seadragons, please take a look at our Scuba Equipment Rental page. Deep down I'm a really nice guy. It's only on the surface when the problems start.